I hope I can keep up with this Monthly Mingle organized by Meeta, the writer and photographer of What's for Lunch Honey. This is something to keep me occupied and discplined, like a regime. 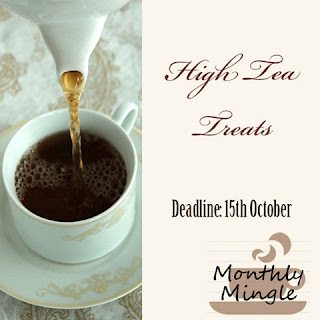 Having said that, this month's theme is High Tea Treats, hosted by Aparna from My Diverse Kitchen. It never cross my mind to make any scones or Mille-feuille, you know the normal treats you are served in typical high teas in grand hotels. The Asian blood in me urge for something more Asian, something that is made with screwpine leaves and coconuts. Coconut is a must have ingredient in any Asian's house pantry. It could be in any form, from dessicated to canned coconut cream or powder form. I have absolutely no idea why anyone hasn't come up with the idea of an Asian high tea, one with ondeh-ondeh, kuih ketayap, cute angkoo kuihs and many more other kuihs you can think of. Not Asian, don't know what's kuih? Click here for a Wikipedia's definition! I believe all these kuihs made in bite size form will be the centre of attention of any high teas! For this month's Monthly Mingle, I've chose to make a mixture of the pandan baby cakes with some coffee and cocoa baby cakes. The pandan or screwpine baby cakes are commonly known as Kuih Putri Ayu or Kuih Seri Ayu in Malaysia. As for the coffee and cocoa flavoured one, I guess it's just another flavour of these kuihs. One thing in common though, they both have coconut as base. See that snowy whitish peak of these baby hills? Those are compressed dessicated coconut mixture. Never tried coconut with coffee before, then you really should try this one. Warning ahead, you can't stop popping one after another into your mouth! Point to note, these are steamed not baked. If you do not have a steamer, here's an idea. Use any deep pot with a heavy glass lid, fill it with water and place a steaming rack or any small bowl turned upside down sitting on a cloth acting as friction would suffice too! These baby cakes also use a combination of ovalette and baking powder as raising agents. Ovalette is a mass of yellow, odourless stabilizer. It could be substituted with emulsifiers or cake stabilizers but definitely cannot be omitted from the recipe! Finally, you'll also need at least 12 petite nylon moulds with Kugelhupf motives. You can purchase them here by Baking Frenzy, highly recommended. I've bought so many stuffs from her and after including postage, they are still relatively cheaper than those I can buy off shelves in Australia! For me, I'm lucky enough to have pals so nice to me to send it to me. Ellena, thank you very much! Our friendship mean so much to me. It's even more special because you're willing to do so much and we've not even met before! Start off by preheating the steamer until the water is boiling. Grease 12 or 24 Kugelhupf moulds (they have 1-tablespoon capacity). I found this best done using a canister of canola spray and spray them into the moulds because they are so tiny and so hard to have fingers greasing all over them! Mix all the above ingredients until it is a little moist. Scoop 1 heaped teaspoon of these into all moulds, leaving one empty. Use this empty mould as a compressor. Press it hard over the rest of the filled moulds to make space for the cake batter later. Repeat the same procedure for the final empty mould. It couldn't get more simple than this, really. For both batter, place all the ingredients for each batter in different bowls. Use an electric mixer and whisk everything into submission until it's pale and light yellow and doubled in volume. Spoon 2 teaspoon of each batter into the moulds. Steam it on high heat for 10mins and you're done! This is my High Tea Treats. This is what I would serve my guests if I were to host one because they are fuss free, look stunning and everyone one would thought you spent hours making them! Thank you Meeta and Aparna for hosting and organizing Monthly Mingle and this virtual High Tea Treats! Gives me something to look forward to every month1 Absolutely love it! 13 comments on "Monthly Mingle: Dual Flavour Baby Cakes"
I love the way you present the baby cake and I know this is really yummy. hehe...I called this small chiffon cake (I think Baby cake sounds better),I had made once before which I added with gula melaka. The coffee ones are made with gula melaka too! Very nice and addictive aren't they? Glad you like it! And you are right, which Asian kitchen is without coconut? Thank you for visiting Aparna! I know coconut is a must have ingredient in your pantry too! Thank you for hosting a virtual Tiffin time for us! Oh mine!!! This is so classic look!!!! I love it I love it... it's more like a Hotel Buffet snacks leh... Great job Quinn!!!! From the photos, i can see that the texture of the kueh and the coconut are well bind together... Love it!!! You'rw finally a lil free Ellena, thanks for the moulds once again! The texture is great because of ovalette but I didn't know coffee and coconut goes so well together. I bought the cake stand from Ebay sometime ago but unfortunately, this is the only one they have. I like it very much too. Special isn't it? I'll try look out for you if I saw anything fancy and bring it back for you when I visit Singapore okay? But i must say... that cupcake stand is really very very unique, is it exp? I have lots of pandan in my garden and want to use it more. These look lovely. Are they similar to mooncakes? What is the texture like? I don't know what to substitute for ovalette. Thank you for dropping by and it surprised me to hear you have a lot of pandan leaves, coming from a garden in Hawaii!!! And it surprise me even more to hear you mention mooncakes! Is your husband a Chinese Malaysian or something? These are no where near mooncake. They are light, sorta like angel food cake but just a tad denser that angel cake. It's the ovalette that gives it the effect instead of egg whites. I believe they sell ovalette or otherwise known as cake stabilizer or emulsifier. Go to the supermarket and walk down the baking and flour aisle, you'll probably see it on the shelf. Good luck in finding Claudia! Thank you, we have a new Asian market here so I may be able to find it. Looking forward to trying these. No, my husband is not Chinese, though we have a large Asian population here in Hawaii. He just puts up with my food experimentations. Possibly even the moulds would be there, or perhaps some mini bundt pans would work? Yeap, you'll surely be able to find it. Doesn't have to the exact same mould, mini bundt or just plain mini muffin tray (if it fits your steamer) would do too! That's a lucky dude you have over there to try out all your kitchen experiments! Mine always complain I changed his menu too often and never makes his favourites enough! Your baby cakes tempted me to try them out & I did. However, it was not well received by my family because they find them a little hard & too dry. Are these baby cakes supposed to be very dry instead of soft & moisture? Please advice as I follow the recipe exactly. Thanks a lot. It is supposed to be very soft and fluffy. It is better to use cold eggs when you cream anything with ovalette in it. Please do try again.... I am sorry yours turned out horribly wrong..